"Clap your hands and raise your voice, equal pay is not a choice." 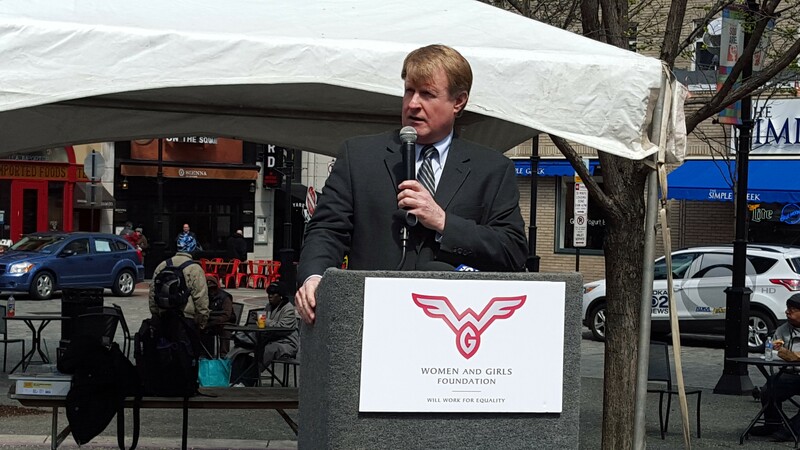 So began this year's Pittsburgh equal-pay-day rally in Market Square earlier today. In addition to the usual dire statistics about the discrepancies between what men and women earn and calls for action, speakers spent most of their time touting the progress around equality and improving workers' rights happening in the city and Allegheny County. This included recent efforts to raise the minimum wage and secure paid sick leave and family leave for workers throughout Pittsburgh. 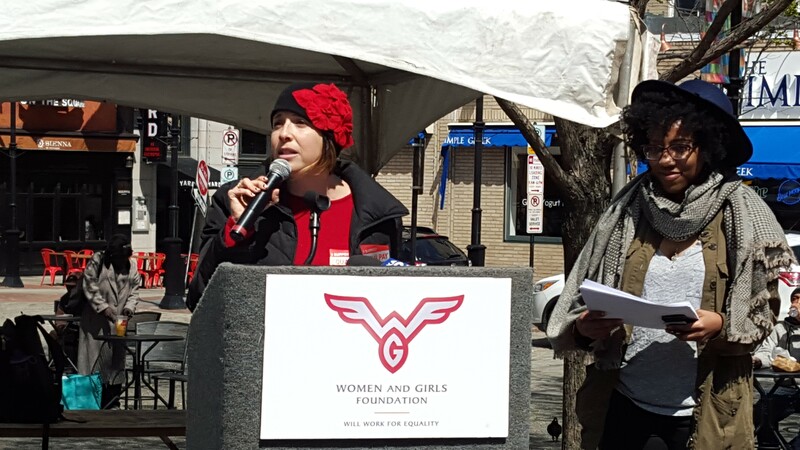 "This year, we've worked together to advance the causes of the Fight for $15, so we can raise the minimum wage in the state," said Heather Arnet, CEO of the Women and Girls Foundation who hosted the rally. "And we are working together to ensure all of us have paid family leave, so we don't have to move to New York or California to ensure we can take care of our children, parents or sick spouses." Arnet highlighted Allegheny County Executive Rich Fitzgerald's efforts to improve employees benefits, including raising the minimum wage for all county employees. Fitzgerald has also attended the annual rally every year. "It's something we're all united on," said Fitzgerald. "Let's continue to fight. Let's continue to ensure everyone's treated fairly." For its part, the city last year announced it would be increasing the minimum wage for city employees. And Pittsburgh City Council has passed legislation for mandatory paid sick leave and to improve working conditions for pregnant and nursing women. "It's sad that it's 2016 and we're standing here. It's appalling that women earn less than men in 2016," said Pittsburgh City Councilor Dan Gilman. "Until the state and federal government step up to ensure people get equal pay for equal work, we'll be back here every year." Despite the local victories, national averages demonstrate women are still being paid less than their male counterparts. In Southwest Pennsylvania, women make an average of 75 cents on the dollar. 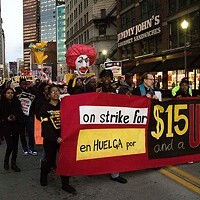 According to the Women and Girls Foundation, "If the wage gap were eliminated, a working woman in the Pittsburgh metro area would have enough money for approximately: 103 more weeks of food (two years' worth); 11 more months of mortgage and utilities payments; 20 more months of rent; or 3,656 additional gallons of gas." "It just doesn't seem appropriate to say "happy pay-equity day." It just doesn't seem appropriate. We all have to own this. 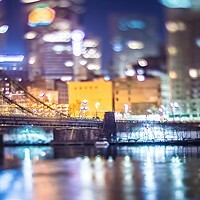 That's the only way to change it.," said Erin Molchany, director of the Southwest Pennsylvania regional office of Gov. Tom Wolf. "While I'm honored to be here, I'd rather come back and celebrate equal-pay day because we've achieved equal pay." To illustrate the inequality that exists in the workplace, the crowd at the rally heard from Estelle Becker, a member of the Restaurant Opportunities Center. Becker filed a a petition demanding Olive Garden’s parent company, Darden, reinstate its auto-gratuity policy and complaining of low wages. "The men get the high-end tables. They're treated with more respect," said Becker. "I'm here to continue the fight because I care about the women coming up in the industry."